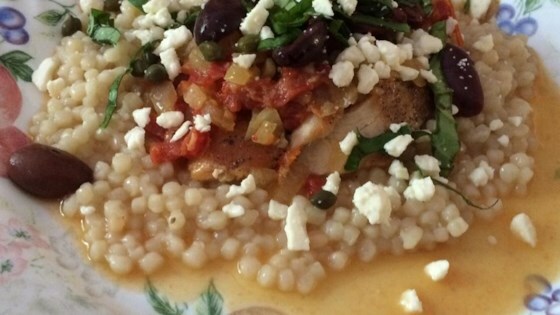 "You will get all the flavors of the Mediterranean in this dish featuring pan-seared chicken breasts in a sauce made with sun-dried tomatoes, chicken stock, garlic and lemon. Topped with olives." Grate the zest and squeeze the juice from the lemon. Stir the stock, tomatoes, lemon juice and lemon zest in a small bowl. Season the chicken with salt and black pepper. Heat 1 tablespoon oil in a 12-inch skillet over medium-high heat. Add the chicken and cook for 6 minutes or until well browned on both sides. Remove the chicken from the skillet. Reduce the heat to medium. Heat the remaining oil in the skillet. Add the shallots and garlic and cook and stir for 1 minute. Add the stock mixture to the skillet and heat to a boil. Reduce the heat to low. Cook for 4 minutes, stirring occasionally. Return the chicken to the skillet. Cover and cook for 5 minutes or until the chicken is cooked through. Sprinkle with the olives, capers, basil and cheese. Serve with the couscous. Ingredient Note: We develop our recipes using a 4-to 5-ounce skinless, boneless chicken breast half per serving. However, there are a range of sizes available in-store, from the butcher counter to the meat case and the freezer section. Use whichever you prefer--just follow the recipe as written above for the best result. If you're using larger chicken breasts they may require a little longer cooking time. Made this as written and it was delicious. Season with salt and pepper to your liking to offset lemon, if needed. The sauce was excellent. I served over farro rather than rice. Sautéed the garlic and shallots in the oil prior to adding the chicken. I thought it gave the chicken more flavor. I used the recipe as directed, it turned out great, will make it again. I omitted olives and capers because we don't care for them. I added Artichokes and 1/2 a can of seasoned tomatoes (basil, oregano). It was very, very good!